After a day of media speculation about Air Force imagery reportedly showing clear evidence of structural damage at or near the leading edge of the shuttle Columbia's left wing, NASA released a single blurry frame late today that raised more questions than it answered. 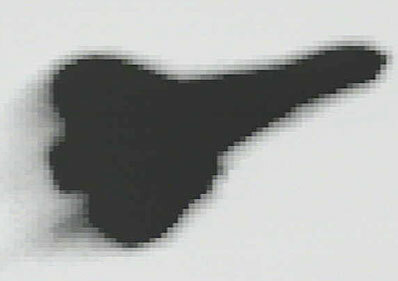 While the picture appears to show a subtle asymmetry in the shape of the left wing's leading edge, along with a plume of some sort trailing behind the orbiter, it did not provide any clear evidence of exactly what type of damage the wing suffered during the shuttle's final minutes. It is possible that specialists can glean valuable insights by enhancing or manipulating the image in some fashion, but nothing obvious jumped out at reporters attending shuttle program manager Ronald Dittemore's final daily news conference. In fact, it was a bit anticlimactic. "We continue to look at photographic evidence," Dittemore said. "It is challenging and difficult and proceeding slowly. We did receive a photo from the Air Force Optical Range at Kirtland Air Force Base in New Mexico. I'm aware there may be some of you who are saying this photo is revealing. We have looked at it, we had it during the week, and it's not tremendously revealing to us yet. I'm not an expert at looking at these types of photos and so we're asking experts to do an evaluation of the photo ... to help us understand if there's anything wrong with the left wing. "It looks a little more distorted on this large screen than it is in the actual photograph. But the nature of the photograph, because of its resolution, has a little choppiness to the wing leading edge. Some people are looking at this area in the bottom area of the photograph, which would be the wing leading edge, and they're trying to draw some conclusions from that area. It's not clear to me there's something there yet." Dittemore did not say if additional Air Force imagery is in hand or whether any other high resolution pictures showing Columbia's left wing are currently in NASA's possession. Aviation Week & Space Technology, a respected aerospace magazine, reported such imagery was, in fact, under study by NASA. But there was no way to know whether the photo shown today was the one referred to in Aviation Week or whether it was a representative frame from a series of images or whether it was something else entirely. In any case, Dittemore said search crews have now identified wing debris near Fort Worth, but it's not yet known which wing the debris came from. Engineers hope to recover fragments from the left wing, which might hold clues about exactly what happened during the shuttle's final minutes. Dittemore said he hoped to have a positive identification in the next few days. He also presented a detailed series of charts showing sensors in the shuttle's left wing that either failed during Columbia's final eight minutes of flight or recorded abnormal pressure or temperature readings. He did not interpret the data, but from the still-uncertain timing of the failures and the progression of abnormal readings, one could make a case that some sort of destructive event must have occurred near the left-side main landing gear wheel well. Wiring to failing sensors mounted in the rear section of the wing ran near the wheel well and because the sensors they ran to dropped off line first, it's possible whatever was going on in the wing occurred at or near the cable harnesses and not inside the wheel well itself. But sensors in the wheel well also dropped off line or recorded unusually high temperatures as the minutes raced by, indicating heat from whatever first affected the cable harnesses was making itself felt in the surrounding structure. But that's pure speculation at this point and it doesn't explain high temperature readings from a sensor mounted on the side of Columbia's left fuselage above the wing. Dittemore said today's briefing was his final regularly planned appearance before the media. The independent Columbia Accident Investigation Board - AIB - is taking over the mantle of authority for probing the Columbia disaster and Dittemore and his team will assume more of a support role in the days and weeks ahead. The AIB, in turn, is expected to control the flow of information about the progress of the investigation and to hold its own news briefings as events might warrant. Officials say one to two briefings a week might eventually be staged, but details remain to be worked out. There will be no briefings over the weekend. A NASA headquarters update will be carried on NASA television Monday morning, followed by a news conference with the international space station's three man crew Tuesday. Later in the day, the AIB will hold its first formal news conference at the Johnson Space Center in Houston. One can only hope the AIB will be as forthcoming and straight-forward with the public as Dittemore, whose reputation and credibility survived an enormously difficult week wholly intact.